Today, I met my lower word limit for my upgrade VIVA in June. I am now at about 6 thousand +/- words. I have been writing on the sequence of the Twelve Prophets (the Minor Prophets), and what the differing sequences between the Hebrew Old Testament (according to the MT) and the Greek Old Testament (the Septuagint) can tell us about the different theological emphases of each respective tradition. SEE! You did not want to know all that! 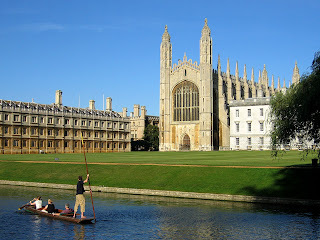 You just want to hear about all the cool things I am seeing in Cambridge! So, today, I first made my way to Tyndale House for a morning of study, but the luxury of my walk consists of walking past Magdalene College, where C.S. 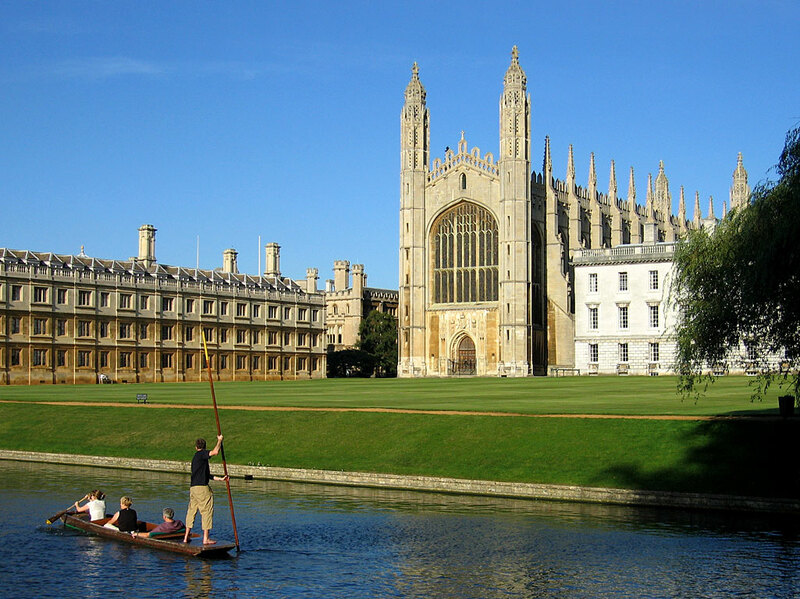 Lewis ended his career teaching, and Rowan Williams is now Master, then through King's College and taking in the vistas of 500+ years of architecture, then over the centuries old bridge over the River Cam (below), and finally through Selwyn College courtyard (right). After lunch, I took my afternoon walk and made my way to Corpus Cristi College, but took a detour through Queen's College and sat for a moment in the chapel. 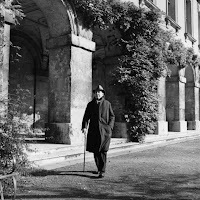 I was heading to Corpus Cristi College to visit their library. They posses the Italian produced Latin Bible of St. Augustine of Canterbury, the missionary and first Archbishop of Canterbury sent from Rome on the Gregorian Mission by Saint Gregory the Great in 595AD to convert the pagan Anglo-Saxons (what's changed? I kid.). This Bible is the one that each Archbishop of Canterbury is "sworn in on" (I am unsure of the correct lingo). Also I was given a tour of the upper library that contains all the rare books, many of which were personal Bibles and prayer books of the Archbishops of Canterbury. Finally, after taking a mile long wrong turn (ergh! 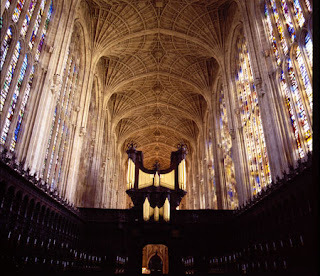 ), I visited the King's College Chapel. This chapel was breath-taking (picture on the right, but doesn't do it justice). It is regarded as one of the best examples of late Gothic architecture. The building of the chapel was begun by Henry IV at the age of 19 in 1441, and finished after much travail by Henry VIII in the late 16th century. 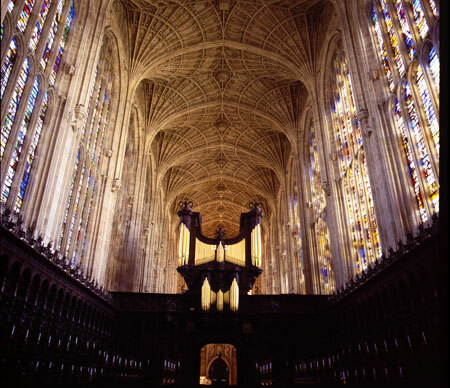 The vaulting of the roof cost a staggering five thousand GBP (about 75 hundred American). The visit was amazing, but not as great as the other chapel visits since silence was not required as in Trinity College, Queen's college, and Selwyn collge. There were many tours occurring (I think in French, German and English), and this made for a less reflective visit. I ended my visit with a quick peek into King's College library. It was very interesting with all it's little book nooks and study nooks. I finished my day with a cup of coffee and a chat with David Instone-Brewer. And then dinner with the Ed Glenny and his wife Jackie, both professors at Northwestern College in St. Paul, MN. And it was good. Day 3.